Most everyone who grew up around Livingston who’s over the age of 40 can remember the little crooked road from Livingston to Celina that was necessary to travel between the two towns. It was one of those roads that those of us who were prone to car sickness hated to have to travel. But the road we knew and the one traveled by folks like A.T. (Archie Thomas) Poindexter and his wife, Lizzie (Lacy) Poindexter, along with their three children, Daisy Belle, Bonnie, and Charles Albert, at the time they moved from Celina to make their home in Livingston around 1921, was only a muddy wagon tract. 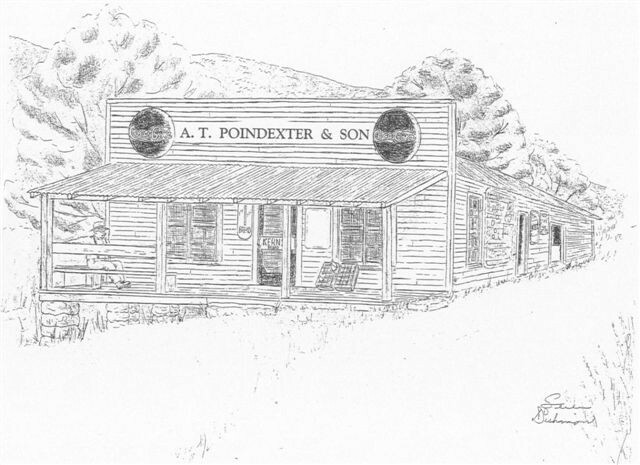 And it was by wagon that A.T. Poindexter moved his family here, where he operated a general store for many years known as A.T. Poindexter and Son. Charlie Pop Poindexter owned and operated the general store for 38 years and 3 days. He and his wife, Lola (Smith) Poindexter closed the store in the 1960s. The store building, built in 1907 by Bob Poston, was located on West Main Street near where the city garage building is now. 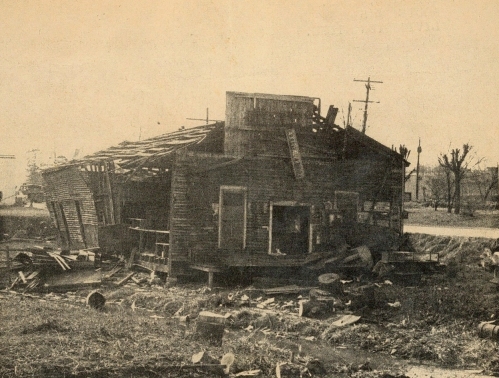 It was the only grocery store in West Livingston at the time it was built, and was located near the first railroad depot, which made it a popular trading center and gathering place. The town creek ran along beside the building. The only son of A.T. Poindexter, Charles Albert, had other jobs before he became a partner with his father and half owner of the business. One of those jobs was helping build the road between Livingston and Byrdstown. It was while he was working on the road that he met and married Lola Smith in 1924. Lola’s family lived in the Boom Community near the Pickett County line. After the story about the Poindexters was published, Steve Dishman of Livingston did this pencil drawing from memory and gave it to Mary Jo Poindexter Ray as a gift. As far as we know, this is the nearest to an actual photograph of the old store in existence. After they were married, the couple took up housekeeping in three rooms that were built in back of the store building, and as time went by, their family grew to include a son, John Thomas, and a daughter, Mary Jo. Charlie Pop, as Charles Albert became known as, also had an older son, Charles Hampton, by his first marriage. Charlie Pop and Lola later moved into and raised their family in the home A.T. and Lizzie Poindexter had occupied that sat where Livingston’s Pizza Hut is now. Six days a week, Charlie Pop would walk from his home to open the store early each morning, and would in turn walk back home after closing each night. Also in very close proximity to the store were at least five sawmills which provided a means for making a living for many men in Livingston and Overton County. Those mills were known as Eastland’s, Medlock, Sid Harward’s mill, Ed Winton’s mill, and a Waymon Cole of Sparta was also the owner of one of the mills. Most all the mill hands traded at A.T. Poindexter’s store, and it was also there that they ate their dinner each day. Usually dinner would consist of crackers and bologna, or cheese and crackers, and a cold drink. And these men not only ate their dinner at the store each work day, but bought groceries for their families there, too. The names of some of those who could be called regulars and very good customers at the store included Alet Poston, Frank Roberts, Byrd Roberts, John Johnson, Wayne Johnson, Monroe Gore, Tootie Wolfe, Herman Roberts, Jason Roberts and his two sons, John and Allen, and Bob Crabtree and his son, Leslie. The store carried most everything necessary for daily living, items such as meal, flour, coffee and potatoes. White beans as well as pinto beans, came in barrels and were sold by the scoop. A great big bag of beans could be bought for 50¢. After being scooped out of the barrel and weighed, the bag of beans was tied with twine. Salt and sugar also came in barrels and were sold by the scoop, too. A large amount of salt could be bought with 10¢. Cereal, oats, and rice were also items found on the shelves, along with all sorts of canned goods. Orange peanut candy was one of the sweet treats the store had, and was measured out for sale by using a large mug. Cold drinks such as Nugrape, Orange Crush, Coca-Cola, Pepsi-Cola, RC Cola, Double Cola, Ne-Hi, and Dr. Pepper could be picked from. Medicinal items included Vicks Salve, cough drops, rubbing alcohol, Soldace, Ex-Lax, Cardui, along with turpentine and castor oil. Sewing thread, handkerchiefs, shoe strings, and jersey gloves were also items that could be found on the store shelves, and for school age children, notebook paper, pencils, and composition books were available. Hog jowl was the only type of meat other than bologna that was carried in the store. Cow and hog feed were also sold, along with all kinds of tobacco products such as King Bee, Hornet, and Apple chewing tobacco, Prince Albert in the can, Golden Grain that came in little white pouches, cigarette paper, and matches. For the hunters, there were shotgun shells and .22 shells for sale. Coal oil was sold from a large tank in the store. A coal burning stove was the source of heat for the store, and during the winter months, the men would gather around the stove to talk and visit. Mary Jo remembers how one fellow in particular had what she considered a very bad habit of spitting tobacco juice on the stove while he sat and talked with the other men. There was a large wooden box near the front counter of the store that held potatoes, and as time when by, the front of the box became quite worn down from the feet of children who would climb up and stand on the box in order to see in the front counter. Charlie Pop bought chickens and eggs from local folks that were in turn bought from him by a Mr. Alloway from Cookeville. The chickens were placed in a pen in the back of the store until Mr. Alloway came in his truck to pick them up. The eggs all had to be “candled” before they were sold to Mr. Alloway. A story is told how a young boy who lived in the neighborhood brought the same chicken in to sell to Charlie Pop three times, and after the third time he was paid for the chicken, Charlie Pop told the young fellow that was enough of that. And this story is an example of, not how easily he could be taken advantage of, but rather that of the kind-hearted and patient person Charlie Pop was. 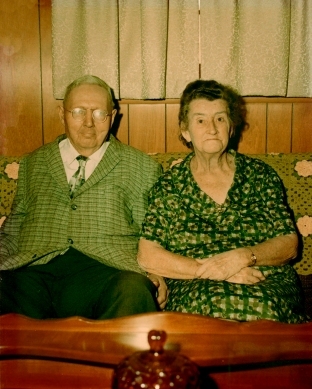 His family members have been told many, many times that if it hadn’t been for the kindness and caring nature of Charlie Pop, many families in Livingston and Overton County would have gone hungry during the depression years, and how on many occasions, he had helped feed these folks through the store. He allowed many people to buy groceries on credit, and when he closed the store for good in the 1960s, he burned the account books to ensure that no one else would try and collect the large amounts of money that had been left owing for groceries and other goods that had been bought on credit at the store and were never paid for. Many times while the store was in operation, his policy about credit would get him in trouble with his wife, who would sometimes complain to him that he shouldn’t be so generous. On those occasions, he would reach in his pocket for the key to the store and, as he handed the key to her would say, “Well, here’s the key if you can do any better than I am, go right ahead.” Needless to say, he was never taken up on his offer. Another example of how good natured he was is one of his regular customers would often forget on Saturday night to buy his favorite twist of tobacco, and on those occasions, he could be found at the front door of Charlie Pop’s home on Sunday mornings, asking if Charlie Pop would care to walk up to the store with him so he could get that twist of tobacco he just couldn’t do without. This man had no doubt that his request would never be denied. Folks traveled in wagons from places such as Hilham and the Okolona Community to do their trading with Charlie Pop, as his reputation for being a very good businessman was well known. In good weather, the store porch was the scene of men gathering to tell tall tales, or to play checkers, and at times when the store wasn’t too busy, Charlie Pop, along with John Tolbert and Albert King, would sit on the porch and sing old gospel hymns. It is also told that a favorite thing Charlie Pop loved to eat sometimes was sardines over strawberry ice cream, something that I definitely would say there’s nothing like! If Charlie Pop were still here today, he would probably wonder about some of us who have to rely on a calculator or adding machine since he never found it necessary to own one. If you picked up an item off the store shelf to see how much it was, you wouldn’t be able to find a price, and that was because Charlie Pop didn’t price anything. It was no problem at all for him to add up a counter full of groceries that had been placed there to be paid for. He kept a tally in his mind of how much the merchandise and store goods had cost him, and figured the price of each item accordingly. He saw no need to price each individual item. Mary Jo, who worked in the store with her father after school and during the summer months while she was growing up, said this really made it hard for her when it came to adding up the bill for customers when she was behind the counter. When the Christmas season came round, the isles of the store were completely filled with all kinds of fruit, candy, and nuts, which would all be sold before the season was over. Stalks of bananas were hung from a rope in the store. Life was very different during the days Charlie Pop ran his business. Each night after closing the store, he put the money from the cash register in a money bag his wife had made out of stripped ticking material for him to carry back and forth to the store, placed the strap of the bag over his shoulder, and walked home without the slightest worry that any harm would come his way. And every morning, he did the same as he returned to the store. This would be almost unheard of today. It goes without saying that Charlie Pop was a very well respected citizen of Livingston and Overton County. He was very active in the Livingston Masonic Lodge, in which he achieved the noble position of Master, and in 1977, was awarded a 50 year pin. He was also Master of the Evening Star Chapter 136 Royal Arch Masons and served as secretary for 37 years. He had to be quite proud of his children. His son, Charles Hampton, or Chip, after serving in the military, owned and operated a Phillips 66 distributorship in Coalinga, CA. Mary Jo, along with her husband, Charlie Ray, were in the restaurant business in Livingston for many years, and were widely known around the area as, not only being good folks of the community, but also offering the very best of home-cooked meals to their many customers. John Tom, as everyone always called him, served in the United States Army, and later retired after achieving the rank of first lieutenant in Livingston’s National Guard Unit. He was one of the best in the law enforcement field while working for Livingston’s Police Department. He served as chief of police for many years, and his father’s principles he lived by were very evident in John Tom’s life, too. He was well liked and highly respected by everyone who knew him. The quiet and gentle man Charlie Pop was and the life he lived each day reflected that caring about his fellow man was of utmost importance to him. He is an excellent example of a person who treated others as he would have wanted to be treated himself.